Discussion in 'Amplifiers' started by Buck, Sep 5, 2018. Got a call from my Sweetwater rep today, my MT15 matching 1x12 cab is being shipped today for delivery Friday hopefully! Loving the MT15 more than ever, beast of a little amp and sounds even better with tubes broken in sufficiently. Really plenty of juice for our live gigs, it's really scary loud and hangs in with my EVH 5150III 50 watt. I've tried this thing through at least 7 cabs now and have settled on the Orange PPC212 closed back recently. I will let you all know how it sounds through the matching cab when I have a chance to give her a good flogging. Rooster7six, Boogie and X-Mann like this. Great news. Let us know how you like it once it lands. And remember, if you don't love it immediately, pound it for a while to loosen that speaker up! MT15 should break in speakers faster than any other 15 watt amp I could think of. Definitely will post a review after some time with it, gonna do some A/B tests and try to get some sound clips. I'm pretty good at breaking in speakers, just ask my neighbors Should have 8 hours on her at a pretty good db level by Sunday, won't be broken in, but loosened up a bit!!! Received our cab Friday. It is autographed by Paul. Anyway Paul had an appearance at the Music Zoo in NY. They emailed me and asked if they could use it for a demonstration that evening. I told them ok and they asked Paul to sign it afterwards. Wondering how many cabinets are signed by Paul? Tried to post a picture but that proved to be to difficult. Here we go, my initial impressions after playing through the matching MT15 cab for around 7 hours with volume about 1/3rd up on full 15 watts. First off, the cab is built well and mine had no visual defects when it arrived. Looks sharp with the MT15 head for sure. Sound wise, it puts out a nice tight and articulate bass response, and really excels with detuned palm muted riffs. Does tend to rattle the head a bit much as it's a smaller cab, but nothing a folded towel doesn't fix. Compared to my Orange 112 closed back, this is not as boxy sounding, most likely due to the fact that the physical cab dimensions are bigger. That being said, it is a bit boxy sounding compared to all the 2x12's I have tried, which is no surprise due to air space. But, for a 1x12 it really does sound pretty nice. I did also notice that it, like many V30 loaded cabs, is a bit mid-heavy to my ears. I had to turn down the mid on EQ even more than the infamous mid-heavy Orange cabs I normally use. I can definitely tell the speaker isn't broken in yet, but it's sounding better and better each hour that passes. I'm trying to get some A/B sound clips but my software is down at the moment. Overall, I'm pleased with this cab but most definitely prefer the fullness of my 2x12's. But for a 1x12, this little cab really does sound nice and is built well. Rock On!!!!!! vchizzle, X-Mann, jfb and 4 others like this. Man, that's a big 1x12! I was looking into a wide body Thiele, but maybe I'll look more at the PRS cab! I agree, I typically don't like Vintage 30s in 112s or even 212s. I love them in 412s though and thats what I use. If I got one, I'd probably look at swapping the speaker for a Greenback or Creamback though. Thx man...yeah, the FX loop on mine is super quiet and works as it should. No noticeable hum at all as a matter of fact, kudos to PRS for getting it right on this one when the Archon has been plagued with loop issues. UPDATE: Here is the bad news, after several more hours on the MT112 cab, I have decided to return it to vendor. The more I broke in the speaker, the worse the vibration/rattle noise out of my head, and a little from the cab became. At certain frequencies, palm muted G# being a major offender with many others, the vibration buzzing noise is almost unbearable. I know it's nothing around the setup, it's mainly the head and a little from the cab. Went through and tightened up the cab screws on back and speaker mount, popped open the head and tightened all screws and reseated tubes, still horrible buzzing noise. Put the MT15 head on 3 other cabs and it was fine, no noise. Put my ENGL head on the MT112 cab and more buzzing noise from that head too. I basically ruled out the issue being my head 110%, so that leaves me with the fact that something about this cab doesn't gel with at least 2 of my heads...something about the way it resonates or the ply thickness??? I'm not really sure, maybe I just got a dud from the factory, but the cab is on it's way back and I will stick with my 2x12's which I much prefer to any 1x12 anyway. I was really hoping this little cab would sway my opinion on 1x12's, considering it is the matching cab, but it has only proved to solidify my "bigger is better" when it comes to speaker cabs mantra!!! Anyways, this is only my experience and YMMV. As I said, I may have gotten a bad cab, not sure. The good news...the MT15 is still my favorite head to date, have exclusively used it on our gigs for the past month and it never disappoints. Never thought 15 watts could be so viciously loud, never thought this much gain on tap could accompany such a stellar clean channel! Sorry to hear about your issue & that the “Little BIg Cab” is going back. I own 3-different cabinets & decided to never sell any of my (Good) cabs again. I do love when the cab matches the head, but I’m past that now. I have a killer Carvin Legacy-3 amp that quiet small for being a 2x12. It has V30’s & is VERY tight & light weight. I have a Friedman Runt 2x12 that’s pretty huge....& a Friedman HBE 4x12 that I paid way too much for.. I will see what cab works the best & report back when I do. Haha! Agreed...no good cab should ever be sold! And I could give two sh*ts whether or not the head matches the cab...it's all about the sound brah! I've tried a TON of cabs/configurations/speakers with the MT15. My favorite 2 are the Orange PPC212 with Celestion V30's and Avatar Contemporary with one G12T75 and one Eminence Governor. Some Greenbacks sounded pretty great too. Curious to see what you like! Thanks for the info on the speakers you’ve tested out & like. Long story short(er), I did a lot of testing on pickups, Guitar woods, speaker types, String gauge & pick thickness.......& I’ve found my window on al of it. I have found 3-Stellar cabinets for different reasons. 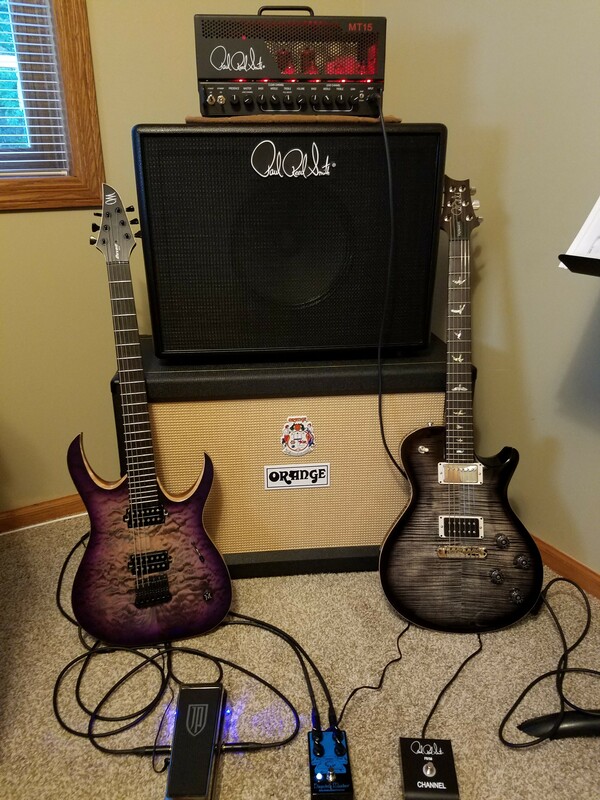 1) Carvin Legacy-3 2x12: This cabinet is the smallest 2x12 cabinet that I’ve ever seen before.it may match the size of he oversized MT 15 single 12 cabinet too. The Legacy Cab is wired in Stereo or Mono & is closed or open back. It’s light weight & sounds much bigger than the size of it. It’s a great travel & gig cabinet. V30’s need to be seriously broken-in at volume as most know. Note: I’d rather have a crisp/clear/brighter speaker and dial in bass or dial out treble at the amp. Plus it seems to work much better in a full Rock band mix for me. 2) Friedman Runt 2x12 V30 loaded cabinet. It’s a BIG 2x12 & closes back, but ported for your pleasure. This cab has SO MUCH PUNCH & definition too. The cab is actually too pretty to take out, but I do. 3) Friedman HBE 4x12 loaded w/ (2) V30’s & (2) G25 Green Back speakers. This cabinet is huge, it’s heavy & the most amazing sounding cabinet I’ve ever played out of. It costs more then most amps. isnt practical, too pretty & overkill for all of the bars that I play in. I never should have bought it & will never sell it. I only wish I had a gig worthy of this 4x12 beast. I can’t wait to run the MT 15 through all of these cabinets. I know these cabinets very well & have run all kinds of different EL34 amp heads through them. More to follow.....& stay tuned for next month. It was rattle from the head. Likely tube rattle. Not the cab. Yes, but only caused by that cab?? The cab isn't rattling just because it causes an amp on top of it to rattle. I always somehow insulate the amp that sits on a cab. Remember, some cabs are made to be as solid as a rock and some are made of woods that vibrate. It's not a flaw. Put something in between the amp and cab that provides some shock cushion if it makes the head vibrate. I think the OP who was having issues with the matching MT15 cab did put a folded up towel between the cab and head and still had rattle issues. I'll see when I get my cab if it was only an issue with his particular head and cab, or if it happens to me too. It's the first I've heard of the rattle issue...if it was common, I would think that PRS/Tremonti would have caught the problem. Right, but if it's the head (tube most likely) it's not the cabs fault. That's all I'm sayin' If the cab doesn't vibrate, it ain't doing its job.